I have fond memories of this traditional story (fable?) at home and primary school. 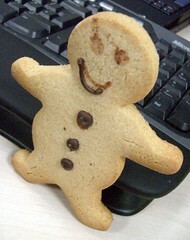 Recently, I found this little chap in the canteen at work, a real treat on a hectic day. He escaped the hungry keyboard, computer, and phone but was no match for foxy silver-haired me. This scribble was published on Saturday, August 9th, 2008. You can follow any banter on this scribble with the RSS 2.0 feed. You can share your inspired musings after typing the anti spam word near the bottom of the page. But no Pinging because its too naughty.